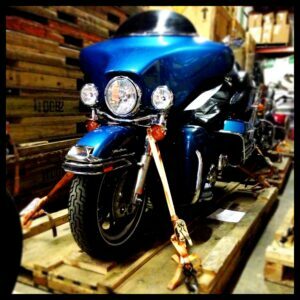 Exhibit Express handles all motorcycle pick-up and deliveries to the local New England area. In addition, we arrange shipping cycles to dealers and residences across the USA. Our specially-equipped trucks pick up and deliver bikes from dealers or private residences anywhere in the USA. Our experienced drivers handle bikes with care. All bikes are strapped on specially-sized skids designed for maximum safety en route and lifted onto trucks via lift gates. All bikes are double-checked before any vehicle movement begins. Bikes are shipped via air-ride trailers that absorb road vibration. Once at destination, the motorbike is carefully unloaded and delivered in perfect condition. Ask about other vehicles moves: ATV, Snowmobiles, Specialty Bikes and more.